A small firm’s transition from AutoCAD to Autodesk Revit LT wasn’t a piece of cake — but it has paid big dividends. Editor’s note: This post is part of a series sponsored by Autodesk, highlighting how Autodesk® Revit LT is improving the design workflow and overall success of small architectural firms. Click here to view the full series as well as other Revit-related blog content. How does a small architectural firm update a design workflow that has been established for nearly a decade? How does a small firm keep up with the changing standards and increasing demands of the AEC industry? 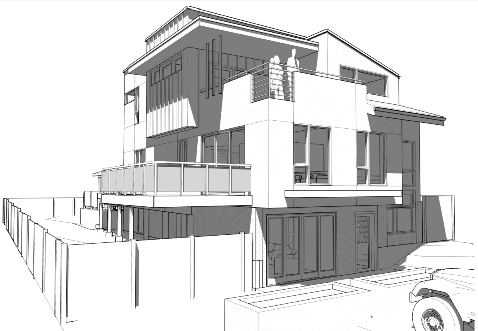 Those were the tasks ahead for our firm, ArcWest Architects, and Autodesk® Revit LT was our answer. Armed with rented software, an enthusiastic and knowledgeable staff, and an existing workflow not much different than the one we would be adopting, our firm set out on what we thought would be a daunting task but in reality became a small but advantageous challenge. Shifting from our AutoCAD-based workflow to building information modeling (BIM) is not as simple as downloading new software and starting a new BIM-based project. The transition to a BIM workflow requires quite a few steps. First, we had to look at our computer hardware. The switch from AutoCAD to Revit LT increased the load on our workstations, which we had to address as part of our subsequent hardware upgrades. We chose industry-standard, high-performance workstations for the new hires and phased out older models. Many of our older systems were just docked high-performance laptops, and we quickly realized that desktop workstations delivered much more bang for the buck. Because our firm was growing, we were ready to add staff, and we took the opportunity to recruit skilled Revit LT operators. These operators had the skills required to use the software as well as to develop BIM workflow standards for our office. They were also allowed the time to use the plethora of online training sources, including CADLearning tutorials that are offered for free for a period of time when renting Revit LT software. These resources helped to expand the staff’s knowledge of Revit LT as our templates and projects became more complex and required more building information — the “I” in BIM — to be embedded in the models. These operators became instructors for later recruits, who had Revit LT skills but needed to learn our office standards and the more advanced modeling techniques we were working toward. Next, it was crucial to create a standardized project template and integrate a new workflow that operated well with Revit LT. With the first Revit LT project, we were doing much more than project design and documentation; we were developing standards and our Revit object library to be used in all future projects. We found the Revit LT project template to be much more powerful than the familiar AutoCAD template — it’s where we began to develop and embed the firm’s identity by inputting information that will automatically standardize line styles, schedules, phasing, graphics, title blocks, and so on, across all projects. In the end, the new workflow felt more like a derivative of our original workflow than a full switch to a new one, as AutoCAD and Revit LT work almost seamlessly — almost. We’d love to see seamless integration of AutoCAD hatch patterns into Revit LT, and to keep dimension lines when reloading a linked DWG. But these and other AutoCAD-related issues really only exist when working with other firms that have not embraced BIM technology. This is sure to improve in the near future as the industry continues to develop an understanding of the value of BIM, and as new professionals enter the field already familiar with the BIM workflow and its benefits. 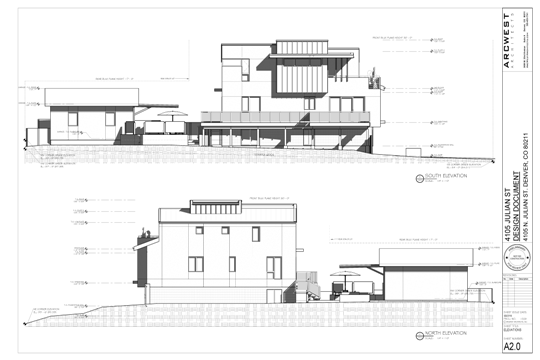 generate project elevations and other 2D documentation, as shown for this residential project. Today, we continue to fine-tune our template as we update schedules and implement the new features Autodesk is regularly adding to Revit LT. This is not ideal at first, as there can be a significant increase in unbillable time updating the templates. But we realize that this investment of time and effort is insignificant compared with the time savings derived by using a properly crafted project template. Revit LT has permeated the office atmosphere, and ArcWest has become a 100% BIM firm. (In fact, in our new workflow, we’re using AutoCAD only to import or export DWG files when working with non-BIM consultants.) BIM has become a vital part of keeping our growing company on track with the many new projects coming through the door. ArcWest has more than doubled in size since transitioning to BIM. In my next post, I will look into the results of the Revit LT upgrade, including the rewards of having the new design workflow and benefits to business overall. Cameron Kruger is an architectural associate at ArcWest Architects in Denver.